Thrill Mom, Grandma, or any special lady this year with any of our most popular Mother’s Day necklaces. 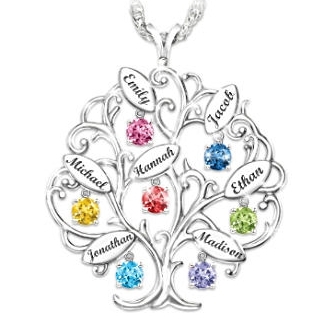 Help Mom, Grandma, or your wife celebrate her flourishing family on Mother’s Day with this best-selling family tree necklace. Perched in the branches of this exquisite piece are engraved leaves that feature up to 7 names with matching birthstones dangling below. Crafted from solid sterling silver, this necklace is a beautiful representation of a family that is rooted in love and blooming with blessings. 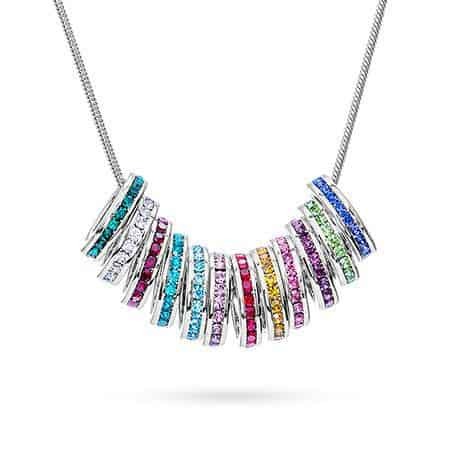 This birthstone necklace combines the brilliance of sterling silver and stainless steel to create a unique and striking piece. Composed of 2 circles, the outer ring proudly displays up to 5 names, while the inner circle contains a collection of genuine diamonds and coordinating Austrian crystal birthstones. An excellent Mother’s Day gift, this personalized necklace is a treasure any woman would be proud to wear. On Mother’s Day, give Mom the gift of handmade jewelry with this necklace, which features a hand-engraved charm that is connected to the sterling silver chain via a Swarovski crystal birthstone. 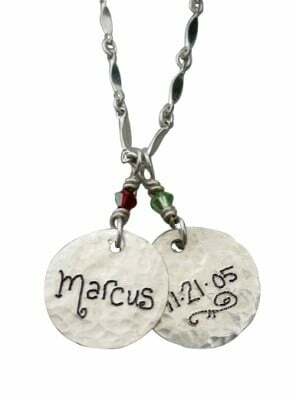 Both the front and back of these charms can be engraved, so you can include an individual’s name as well as their birthdate. With its versatile design, it is dressy enough to be worn with her most fashionable apparel while being casual enough to pair with a T-shirt and jeans. As a unique feature, this charming necklace lets you add more charms as your family grows. The creative design of this stunning piece beautifully portrays how a mother’s heart is forever linked to that of her children. Featuring a sterling silver composition, it is accented with 18-karat gold plating and a pave of clear crystals. To represent each precious child, it includes up to 8 dangling heart charms that are encased in shimmering Swarovski crystal birthstones. Perfect for Moms or Grandmas on Mother’s Day, this sterling silver birthstone necklace is plated with 18-karat gold for a warm, rich look. 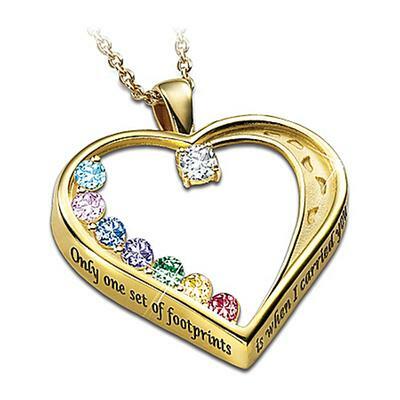 One side of this golden heart reveals a set of footprints, while the opposite side features a string of up to 8 genuine crystal birthstones to represent her children or grandchildren. 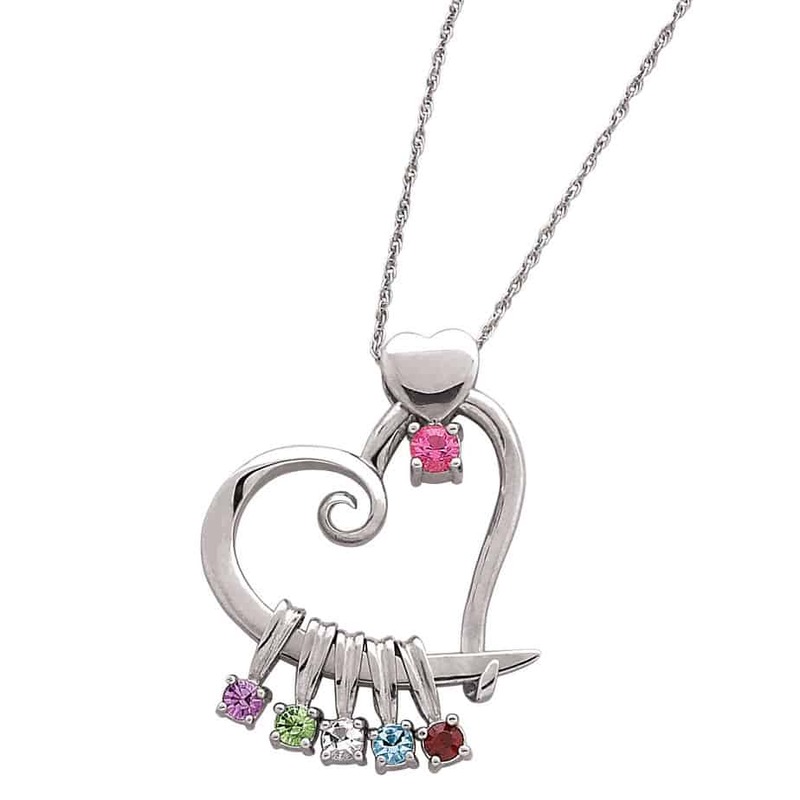 The lucky recipient is also represented in this piece with her own birthstone located at the top of the heart. Engraved with words from the beloved “Footprints in the Sand” poem, this necklace is a stunning reminder of a Mother’s love and the Lord’s tender care. 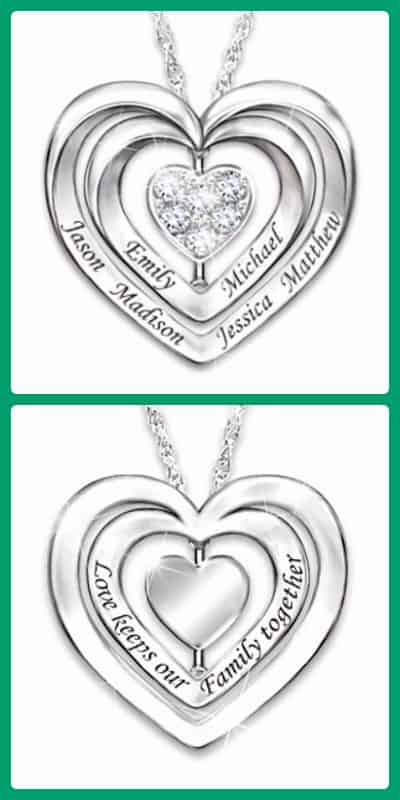 This personalized heart-shaped pendant lets your loved one share on the outside what she holds dear on the inside. The sterling silver Mother’s Day necklace includes up to 6 names along with their respective birthstones. A genuine diamond shines brightly from the bottom of the heart charm. As part of its elegant and integrated design, it features the sentimental message “Our Family Is Held Together by Love” engraved on the back of the charm. Arriving in a specially designed gift box, it is sure to take her breath away on Mother’s Day. 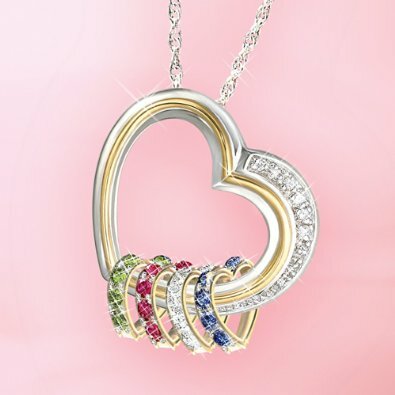 Thrill Mom, Grandma or your wife this Mother’s Day with a dazzling necklace created just for her! 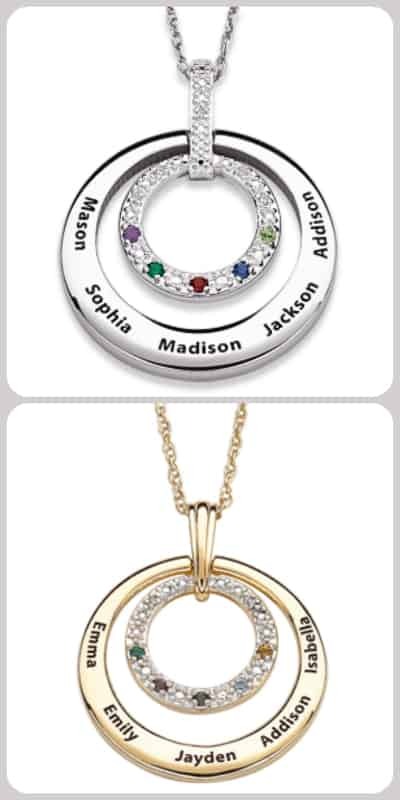 Perfect for larger families, add up to 14 birthstone charms in your choice of silver or gold. 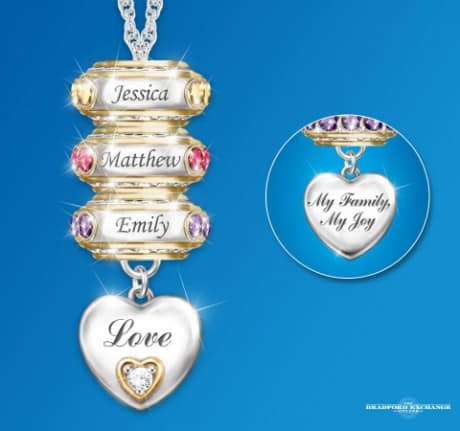 As your family grows, you can order additional charms to represent the new loved ones. One of our favorite Mother’s Day necklaces for 2017, this slider pendant features a heart charm that holds Mom’s birthstone. Directly below it is an open heart that holds up to 7 dangling Austrian crystal birthstones. This open-heart design beautifully portrays how her own heart is always open to her children. Click here to see this necklace in yellow gold. Click here to see this necklace in 10k White Gold. A mother’s heart overflows with love for her children, and this stunning piece illustrates just that. With its circular design, this sterling silver necklace features a heart-shaped window with up to 6 floating heart-shaped birthstones. 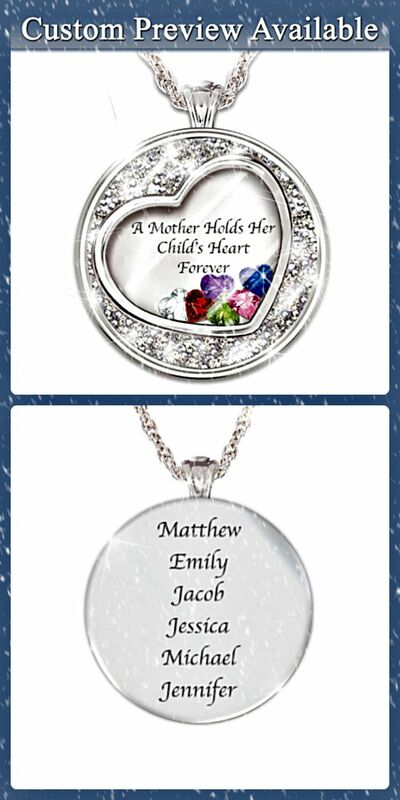 The back of the necklace is engraved with the children’s names to create a sentimental, one-of-a-kind gift Mom will cherish. For a dazzling look, the center heart of this necklace features a cluster of genuine diamonds. To enhance the beauty of this exquisite piece, the diamond-studded heart spins, which captures and reflects light to make Mom sparkle even more than she does already. The 2 larger heart-shaped frames can be engraved with up to 6 names for a gift she’ll cherish forever. No need to spend a fortune to get Mom a brilliant Mother's Day necklace that she'll treasure - this adorable personalized necklace is well under $50! You can personalize it just for Mom by choosing up to 10 Austrian crystal birthstones, which are elegantly nestled within the ring. To polish it off, the circle’s outer surface is adorned with little hearts for a look that exudes love at every angle. Composed of sterling silver with sparkling 24k gold accents, this unique necklace is a thoughtful gift for Mother’s Day. Order up to 6 removable, interchangeable charms to represent children or grandchildren. 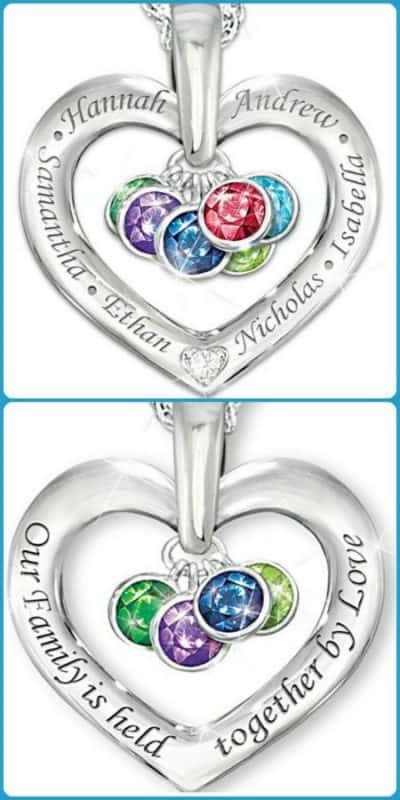 Each charm features a loved one’s name surrounded by the corresponding genuine Swarovski crystal birthstones. The crowning touch of this stunning necklace is a heart-shaped charm that features the word “Love” on one side and the phrase, “My Family, My Joy” on the reverse side. Whether inscribed with names of children or grandchildren, this necklace is a piece Mom or Grandma will want to wear again and again. This expertly crafted necklace tells the story of how each child’s unique personality and characteristics point back to their loving mother. These creative design elements come together to form a beautiful golden heart that provides the perfect way to celebrate Mom or any other loved one on Mother’s Day. Click here to see the necklace in silver. As a testament to a mother’s love, this solid sterling silver necklace is shaped into the universal infinity symbol and features a single dazzling diamond. The theme of endless and unbroken love is carried into the dangling ring-shaped charms. 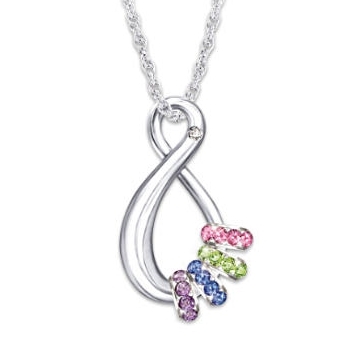 You can add up to 6 Swarovski crystal birthstones to represent each of Mom’s or Grandma’s loved ones. Thrill Mom, Grandma, or any special lady this year with any of our top Mother’s Day necklaces.